Line 4 heart shaped moulds or Muffin tins with clingwrap. Separate the strips of the salmon. 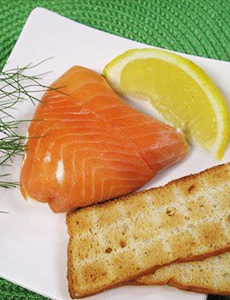 Line with strips of salmon leaving sufficient fish over the edges to be able to cover the bottom of the mould when you fold it over. Add the finely grated lemon rind and the juice of the lemon to the onion dip with the parsley and dill and mix well. Season with sea salt and freshly milled black pepper. Fill into the moulds and then cover over with the extra fish. Wrap in the clingwrap and chill well. To serve unmould onto a plate, garnish with a sprig of herbs and Melba Toast.